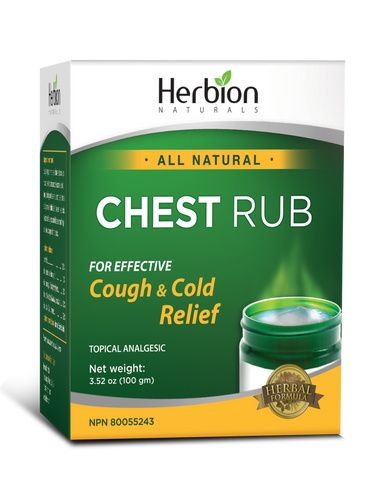 Fast-acting Herbion chest rub remedy is specially formulated with clove and eucalyptus essential oils to help relieve temporarily colds and cough and most of their symptoms such as aches and pains of muscles and joints associated with simple backache, lumbago, strains and sprains (involving muscles, tendons and/or ligaments) and arthritis. Consult your health care practitioner for use beyond 7 days. Rashes or burning discomfort have been known to occur, in which case, discontinue use. Hypersensitivity, such as allergy has been known to occur, in which case, discontinue use. For external use only. Avoid contact with the eyes and mucous membranes. Do not apply to wounds or damaged skin. Do not tightly bandage. If overdose or accidental ingestion occurs, call a poison control center immediately. Discontinue after 7 days or re-occur within a few days. Consult a health care practitioner prior to use if you are pregnant or breast feeding. Consult a health care practitioner prior to use if you are taking anticoagulant medications. Do not use if you are allergic to salicylates. Do not apply on irritated skin. If you have chronic lung disease or shortness of breath, do not use this product unless directed by a physician. - Apply balm thinly and evenly to the affected area up to 3-4 times per day. - Application should be under the supervision of an adult.